Why Microwave Resonator-Based Sensors Are the Ideal Approach for Accurately Measuring Moisture in Food Products. In the food production industry, there are strict health and safety regulations in place to ensure that consumers receive a product that is of superior quality. The ramifications of not meeting these government and industry standards can be hugely detrimental to a food producer. If poor-quality food were to make it to market, it can cause illness to the consumer resulting in legal consquences for the manufacturer. On the other hand, food that does not pass quality standards can result in wasted materials, higher manufacturing costs, and ultimately a loss in revenue. When it comes to cheese manufacturing, being able to measure the moisture and temperature of the material are critical parameters for meeting quality standards. 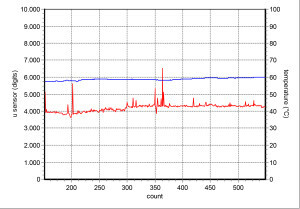 The amount of water that is contained in cheese can greatly affect its quality, processing, and shelf life.This article will explore the benefits of relying on microwave frequencies and RF resonators to accurately measure the moisture of soft cheeses, in particular mozarella, and includes a case study that gives manufacturers real-world guidelines for setting up a microwave resonator-based sensor to measure the moisture of cheese. Using a microwave resonator-based sensor solution, cheese manufacturers can obtain a precise measurement data for calculating the moisture, or water content, of mozarella. By accurately measuring moisture, microwave RF sensors help manufacturers reduce the growth of bacteria, helping a company achieve the highest quality product. Microwave sensors can also be used to make other measurements, such as weight, density, and temperature, as well as identify foreign particles or substances that have come into contact with the cheese. For this article, we will concentrate exclusively on the benefits of measuring moisture, since this is the most critical measurement at hand. There are several characteristcs about advanced microwave-based sensors that make them the ideal solution for measuring the moisture content of cheese. One benefit is that they enable manufacturers to take a precise measurement within a small area. 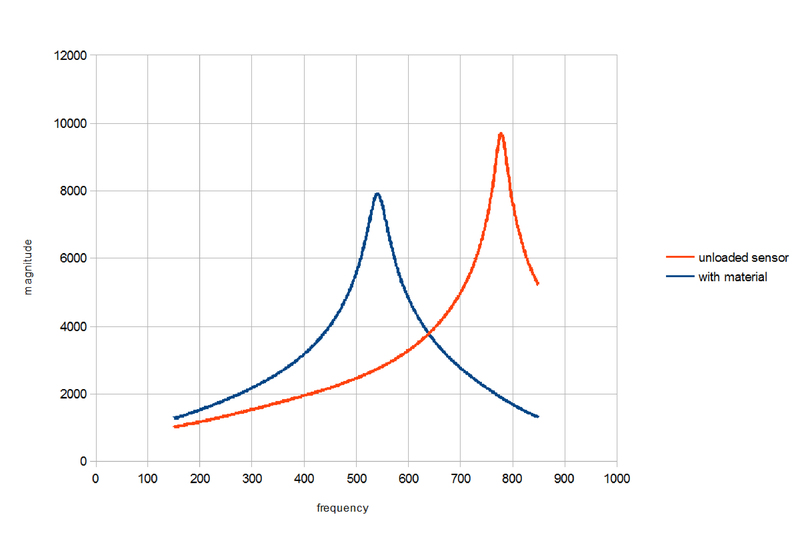 Using the microwave resonator technique, RF sensors can detect the moisture level percentage of a product as small as 2-3 cm. The measurement field always stays inside the material compared with capacitive sensors, which use a larger measurement area and therefore often measure outside of the substance. Microwave measurements also offer the advantage of being able to detect the moisture at both the surface and core of the product. This makes it easier to measure challenging products, for example, those that may be dried at the surface only. It can be difficult to measure those types of products with capacitive and optical measuring methods. 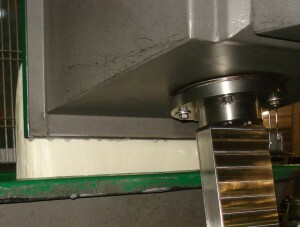 Microwave resonator-based sensors also meet cheese manufacturers requirements for in-line measurements, as the sensors can be installed directly on the production line. For production lines with wide conveyor belts measuring 1 meter or more, several sensors can be used in a row. Using inline sensors, manufacturers can eliminate the need to use a probe and measure one-off samples in a laboratory, which is the traditional way of performing moisture measurements. With inline sensors, manufacturers can take an immediate measurement from the production line; no preparation of samples is needed. This method is significantly faster, uniquely handling microwave frequencies of up to 65 GHz at a rate of up to 10,000 measurements per second. In addition, it is infinitely more accurate, with industry research showing that accuracy increases when a measurement is taken inline vs. laboratory samples. Mounting the microwave sensor within the production line is a simple process. 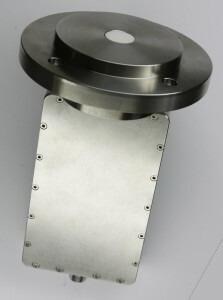 The microwave sensor is mounted via a flange. The dimensions of the standard flange are shown in Figure 3. Manufacturers can also request specific flanges that fit their exact requirements. For measurement of electrical characteristics, the resonator has two ports: one for sending and the other for receiving microwaves. For analysis purposes, the absorption of the microwaves on their way from the transmitting port to the receiving port needs be taken into account, and the type of material that is being measured can make an impact. 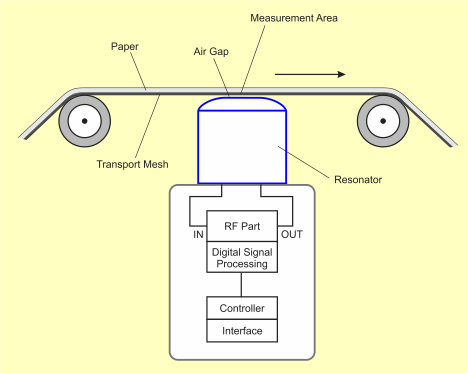 For measurement, the resonator will be connected to an evaluation unit. A laptop will show the transmittance measured. 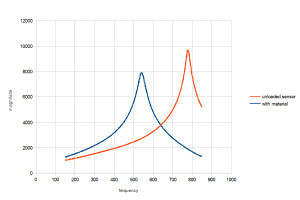 Applying the microwave transmittance over the frequency, the manufacturer can find a maximum with a frequency of fRES_unloaded with an empty test resonator. Putting any material on the resonator will subsequently shift the maximum to lower frequencies, i.e., to the frequency fRES_loaded. This will make it possible to distinguish between different levels of moisture within the material. The curves can be easily reproduced. The analysis shows that changes in humidity are detectable in a one-tenth percent range without any problems.The output of the sensors is limited to the transmittance of one frequency. The results show one value that corresponds with the moisture of the material. Microwave resonator sensors can be easily integrated in a transport system of a production line. Full measurement results (including graphs, etc.) can be displayed on a local laptop or on a PC at a central work station (e.g. connected by Ethernet), or on panel PC on the machine. Additionally, an industrial display panel can be fitted on the actual line to show an instant summary of the moistiure percentage and temperature. 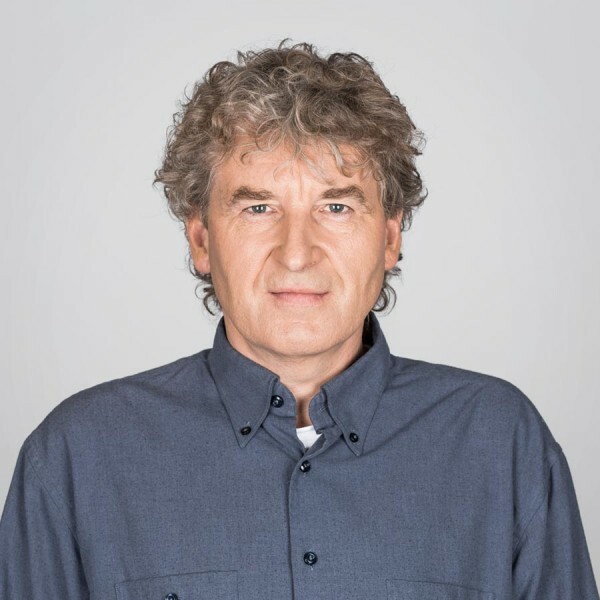 The sensor can be monitored and controlled via a standard IEEE 802.3 Ethernet communication interface, allowing manufacturers to easily access data via any connected computer. For rugged production environments, i.e., fast-moving production lines, the sensor also supports Profibus and current loop (4-20 mA) interfaces. By implementing customized calibration formulas and measurement tables into the sensor firmware, manufacturers can attain a precise reading of the mozarella cheese‘s moisture. Figure 7 shows the raw measurements that were taken on the cheese production line. 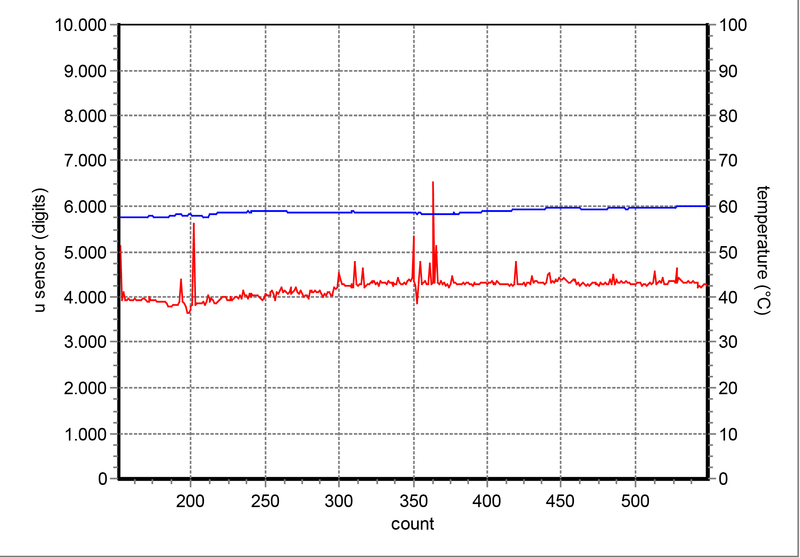 The red line illustrates the raw data moisture, and the blue is the temperature. The large spikes are caused by manual interference, e.g. taking a probe for the lab. With manually taken probes, where the moisture is measured in the lab, a calibration of the sensor is possible. The final calculated data for moisture in cheese production is shown in Figure 8, with green being the moisture content and blue the temperature. To get the value for the moisture content, a calibration was necessary. 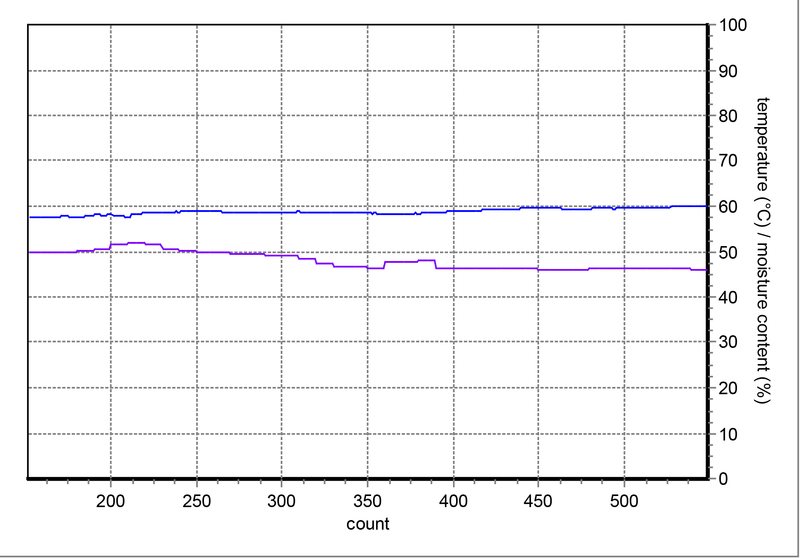 Before calculating the moisture value, a special average algorithm was applied to the raw data. 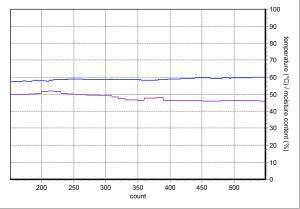 Compared with the lab values in this application, an accuracy of around 0.5% was achieved. Microwave sensors work with an open resonator. Therefore, care has to be taken not to exceed the maximum permitted RF power as determined by the appropriate DIN norm (especially DIN EN 61000). In operation, the measured material (e.g. a layer of cheese) causes additional attenuation of the RF power, so the requirements of the DIN norm are fulfilled. For the unloaded sensor some more precautions are necessary. In this case a special level control circuitry should be used. By using microwave sensors, cheese producers can continuously measure their product to ensure the correct moisture at all stages of the manufacturing process. Microwave resonator-based sensors offer a distinctive advantage over methods such as capacitive and optical sensors. They allow manufacturers to take precise measurement within a smaller area, can detect the moisture at both the surface and core of the product, and can be installed directly on the production line, resulting in speedier, more accurate measurements. As a provider of microwave sensors, WORK Microwave develops and manufactures high-precision sensor solutions for a wide range of measurements and applications used by the food, pharmaceutical, and chemical industries. Our sensors have been used with a variety of cheese types, including mozzarella, soft cheese such as Philadelphia® cream cheese, and hard cheeses like parmesan, enabling manufacturers to maintain the utmost quality while meeting health and safety regulations.